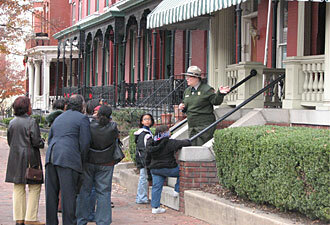 Walk the historic streets of Richmond in the footsteps of a prominent 20th-century businesswoman and community leader. Born during the era of slavery, she achieved success despite segregation and the limited opportunities offered to her race. Maggie Mitchell was born into poverty in 1864 to a mother who was a former slave and a father who was a Confederate soldier. When she was 14 years old, she joined the Independent Order of St. Luke (IOSL), a national fraternal burial society established to minister to the sick and aged, promote humanitarian causes, and encourage individual self-help and integrity. She proved to be a natural leader and quickly rose through the ranks to hold the organization’s top leadership position as Right Worthy Grand Secretary. During her tenure, the Order's numbers grew substantially, and its finances improved by the establishment of a newspaper, a factory, a store, and a bank. Mrs. Walker founded the St. Luke Penny Savings Bank in 1903 and served as its first president, making her the first woman to charter a bank in the United States. Financing businesses and homes loans, Maggie Walker helped to further the American Dream for more than 600 African Americans in the Richmond community. Later, when her bank merged with two other banks to become Consolidated Bank and Trust Company, she served as chairman of the board. The bank thrives today and is the oldest continually African American-operated bank in the country. By 1905, when she and her family purchased the Jackson Ward home at 110 ½ East Leigh Street, Mrs. Walker had already achieved some measure of business success. 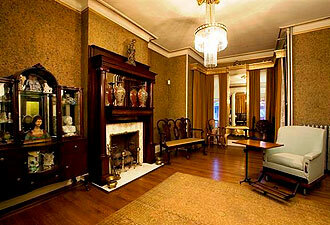 The residence and neighboring buildings are preserved today as the Maggie L. Walker National Historic Site. Begin your journey at the visitor center, located at 600 North Second Street, where a short film and exhibits place her life and extraordinary achievements within the context of American history. Explore Maggie Walker’s accomplishments and legacy by joining a National Park Service ranger for a guided tour. Learn about her life from her youth, characterized by poverty and family misfortune, through her rise in the IOSL and her bank presidency. As you visit the 28-room home, which is restored to its 1930s appearance, pay special attention to the Walker family’s original furnishings. To see even more of the Jackson Ward neighborhood, download the map and podcast tour. The park is open Monday through Saturday from 9 a.m. to 5 p.m. (March through October), and Monday through Saturday from 9 a.m. to 4:30 p.m. (November through February). Reservations are required for groups of 10 or more. 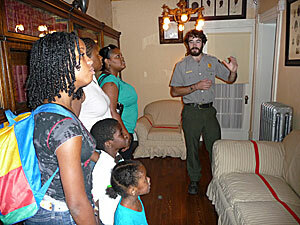 All activities at Maggie L. Walker National Historic Site are free of charge. Special programs are held throughout the year. Join us for Mrs. Walker’s annual birthday celebration, held each summer on the weekend closest to July 17. (That’s Saturday, July 17 in 2010). To learn more about Maggie L. Walker National Historic Site, visit the park’s website or call 804-771-2017. And, while you’re in town, take your history experience a step further by including stops on the National Park Service’s Richmond travel itinerary and visiting Richmond National Battlefield Park.